About 52,700 people lived in the south division of the Kayts before 1990. Now only sixteen thousand have returned to their lands. 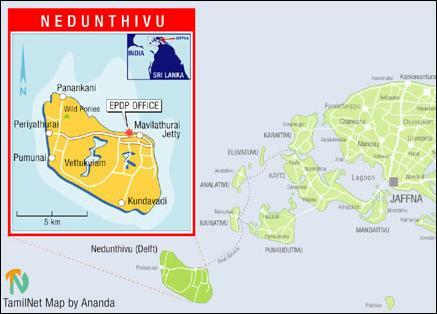 In Mandaithivu area of the 5030 residents only 1131 have returned, sources said. About 20 thousand people lived in Punguduthivu area before 1990 and now only four thousand residents have returned, sources said. Meanwhile of about 22 thousand people lived in 1990 only 8 thousand have returned to the villages of Allaipitty, Mankumban, Velanai and Saravani, sources said. The main reason attributed for the reluctance shown by the IDPs to return to their lands is the presence of soldiers of the SLA and Sri Lanka Navy (SLN) in the peninsula even after signing the ceasefire agreement and also of the SLA maintaining high security zones occupying civilians houses and fertile cultivable lands in one third of the landmass in the peninsula, civil activists said. Majority of the IDPs are still staying in welfare centres and in rented houses. Some IDPs are staying with their relatives, civil sources said.